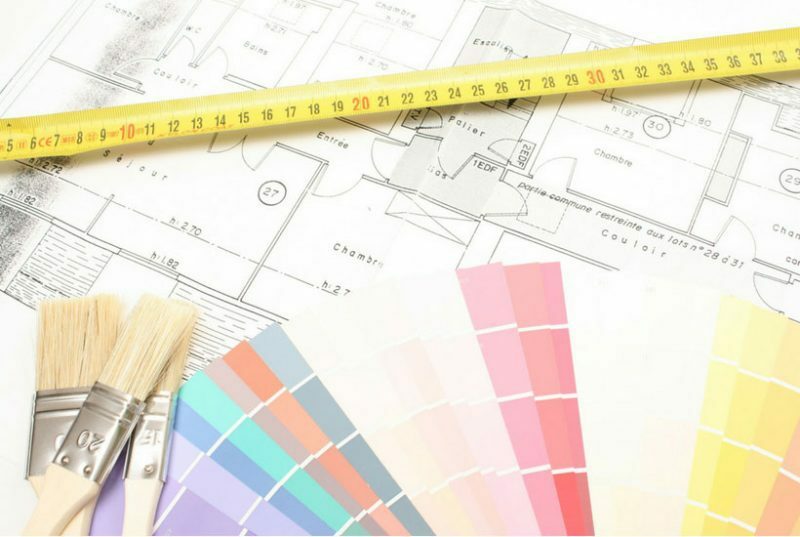 Interior Paint Colors: Worried about choosing a color scheme for your entire home? 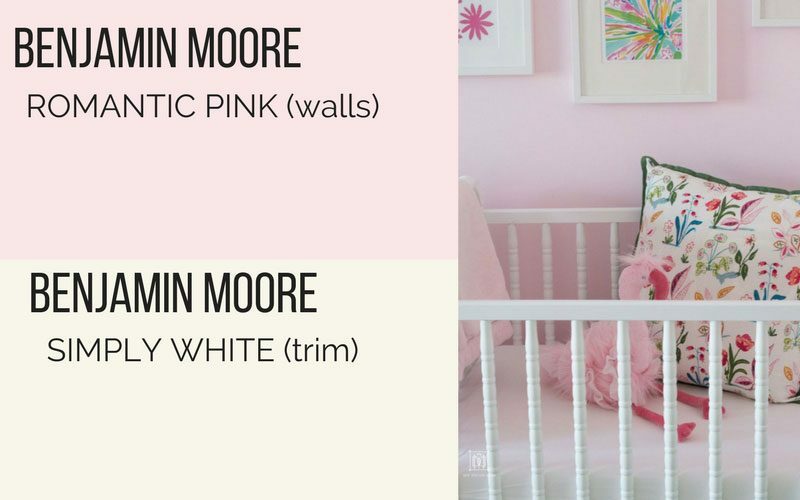 Follow these rules in choosing a color palette for your house and you will love the colors! 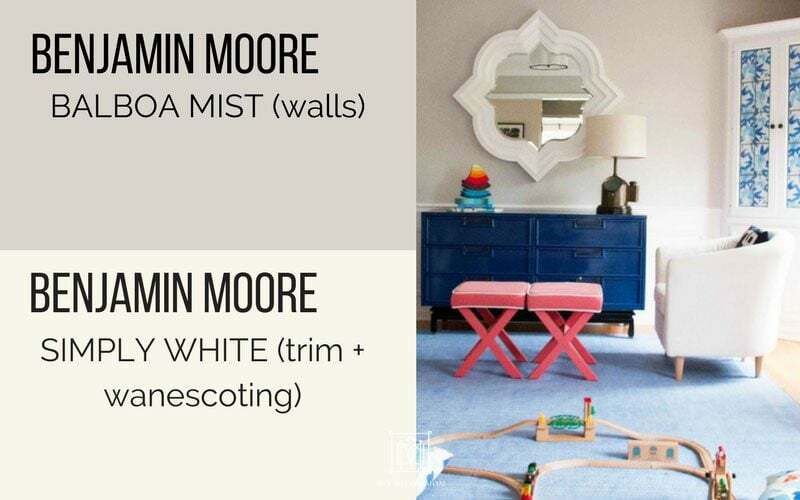 Plus, I will share each room in my house and the specific paint numbers so you can recreate it for your home! When you move into a new house, you might not even know where to start. I mean, how do you pick out a whole house color palette? It can be daunting but it need not be! 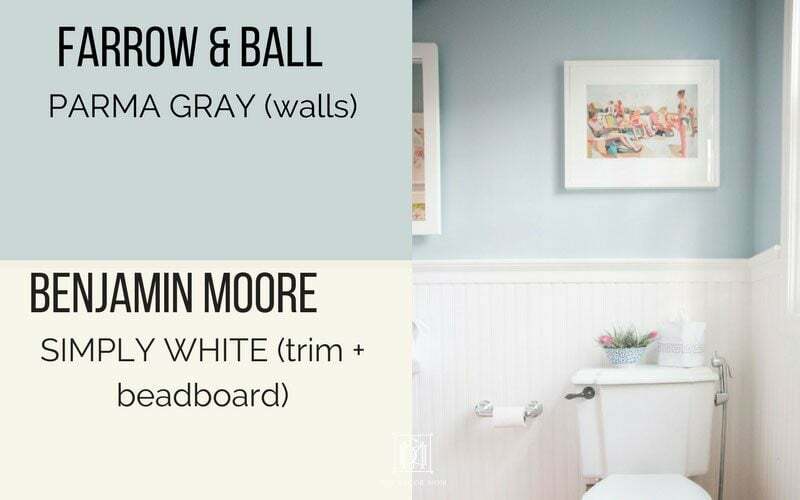 Here are my top tips for picking out paint colors for your home and making a whole house color scheme including my favorite interior paint colors we use in our house. 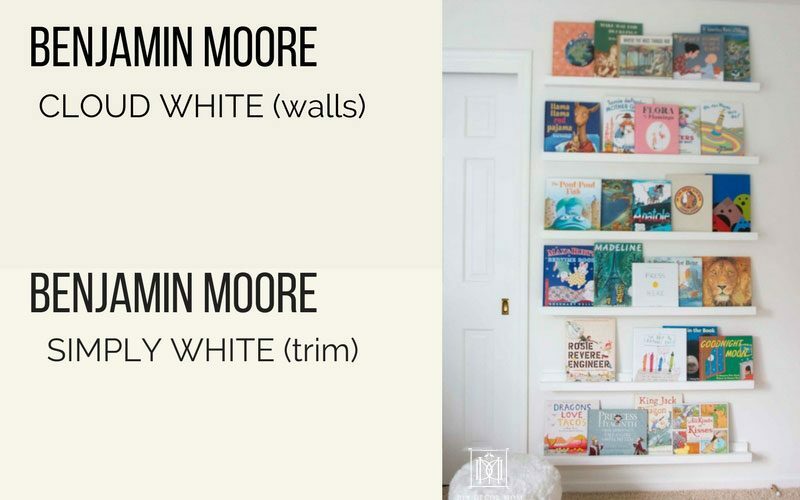 Plus, I’ll share what type of paint sheen I use for all of the walls in our house, and what I recommend you use too! For textured walls I recommend using a flat paint sheen so it minimizes the look of the texture. Before you paint though, make sure you grab this! It has cut my time painting in half! Seriously–I would pay three times the price happily to save as much time as it saves me! I knew from the start that I wanted an airy feeling house, but one that didn’t feel “cold.” So we went with warm light gray colors, warm off-whites, and colorful accents for the smallest rooms in the house. If you want a darker and moodier feeling, then go darker. 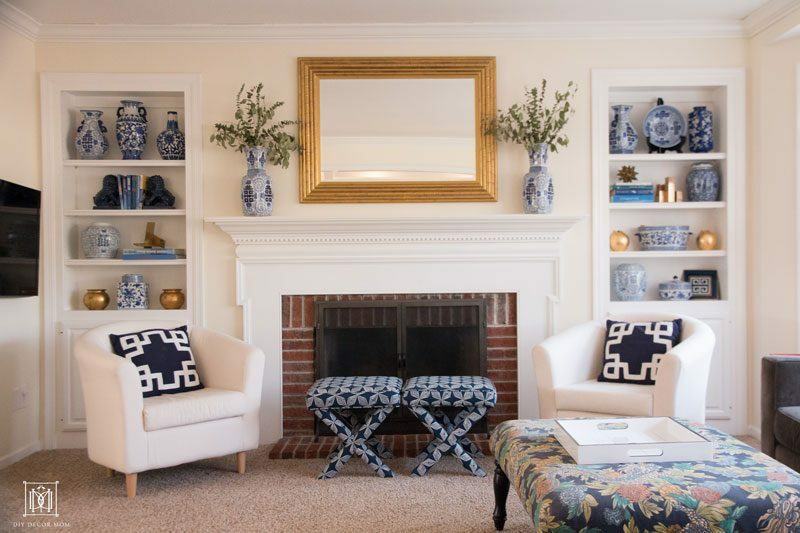 And if you want a brighter but slightly colder feeling to the house, go with whites but choose “bluer” ones like Decorator’s White by Benjamin Moore instead of Simply White by Benjamin Moore. In our house, we choose a neutral color scheme of warm light grays and whites, so that is what I will show you today. 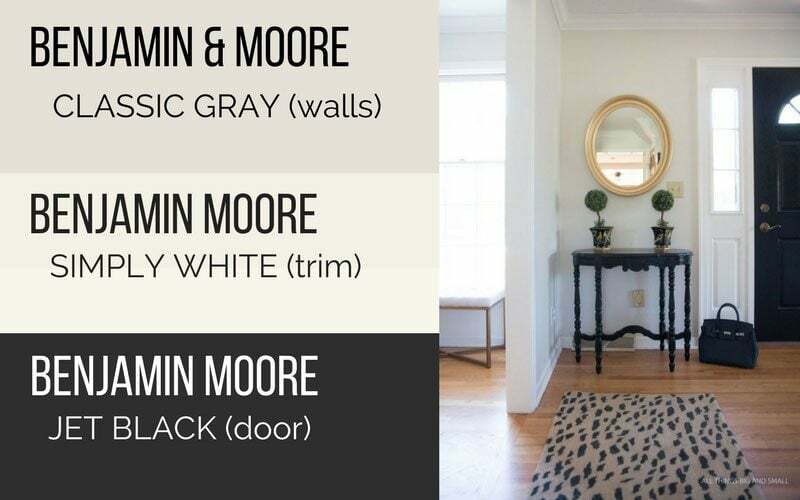 Our entryway color is Benjamin Moore Classic Gray. 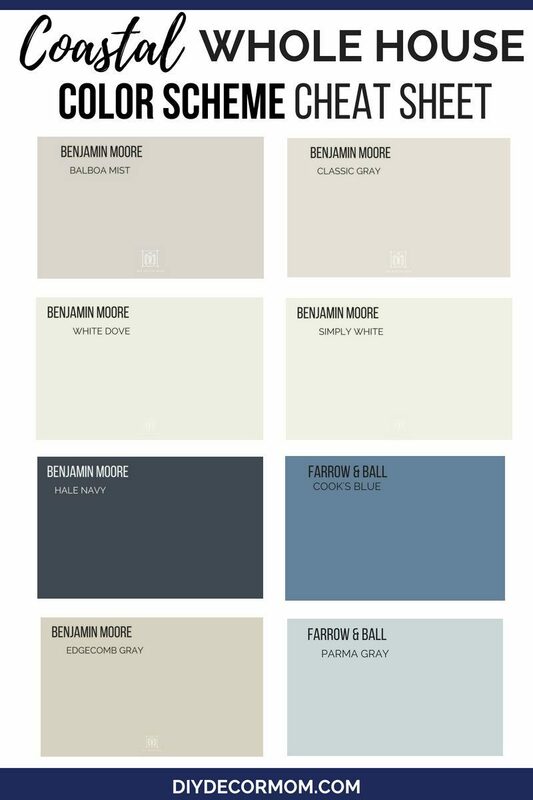 See my complete review of Benjamin Moore Classic Grey here. Our door color is Benjamin Moore Jet Black (semi-gloss), and the door surround is Benjamin Moore Simply White in semi-gloss. See how I painted the fiberglass door here. Benjamin Moore Balboa Mist (see the complete post on BM Balboa Mist here) and Simply White wainscoting. See everything in the playroom and all the sources here: PLAYROOM. Benjamin Moore Balboa Mist and Simply White Trim. For the living room and the dining room, we went with Balboa Mist. It is slightly darker than Classic Gray while still being nice and airy! Benjamin Moore Cloud White (see my complete review here). 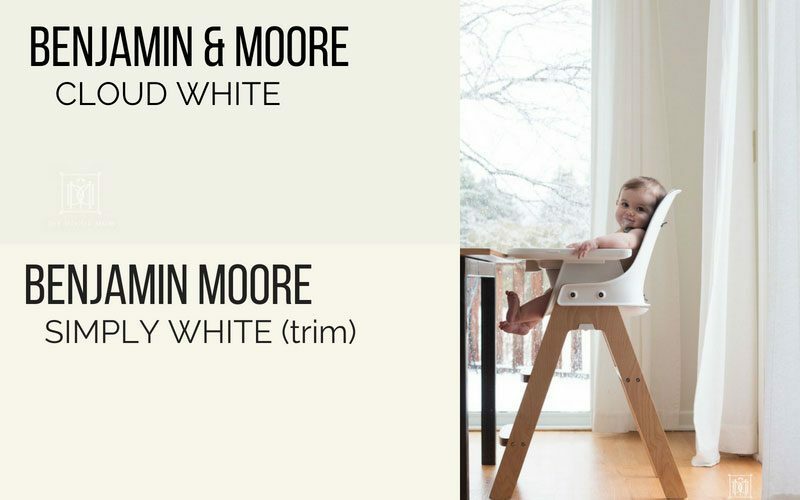 For our kitchen and breakfast area, we chose to go with Benjamin Moore Cloud White. It goes really well with our trim which is Benjamin Moore Simply White. 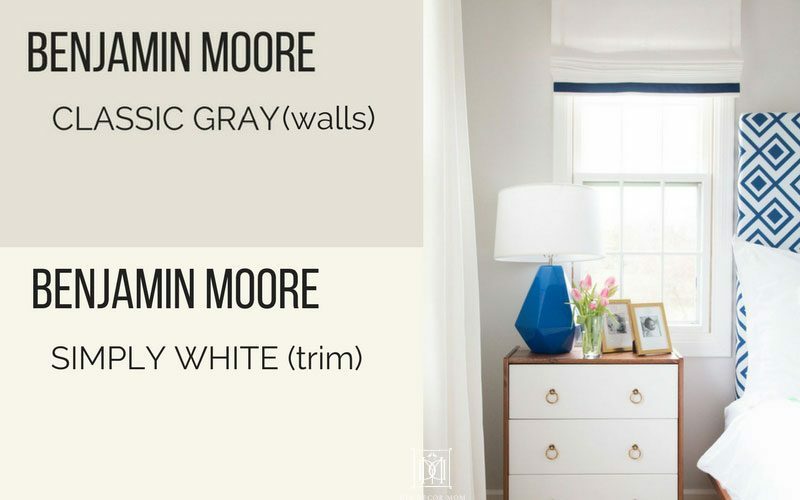 Benjamin Moore Classic Gray and Simply White. We use semi-gloss paint on all the trim and the beadboard so it is scrubbable and holds up better. All the walls in our house are eggshell. Farrow & Ball Parma Gray walls and Benjamin Moore Simply White beadboard and trim. 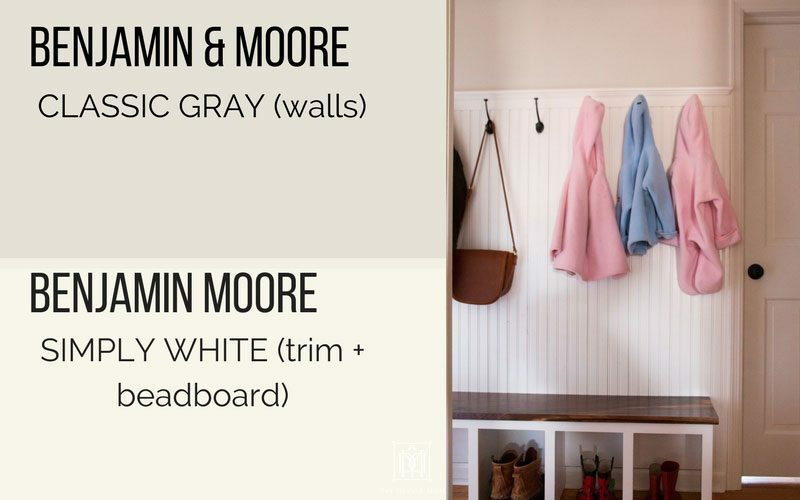 See this post on DIY Beadboard to make your own! 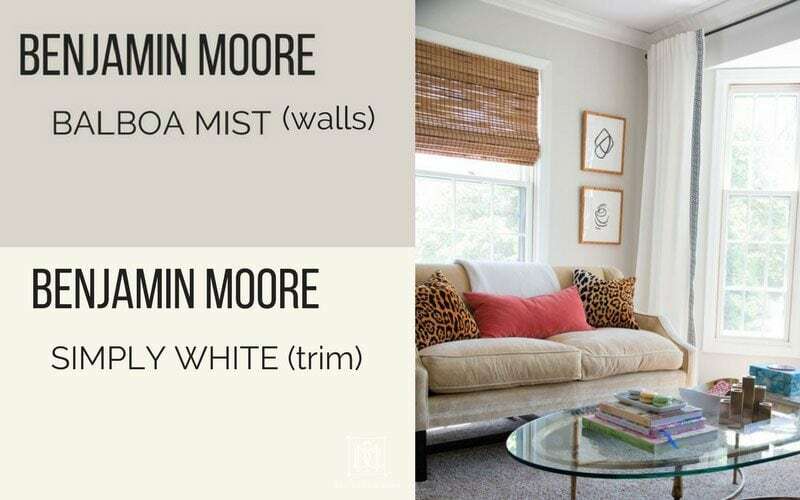 Walls: Behr White Chocolate and trim: Benjamin Moore Simply White. I wouldn’t recommend this color (the walls) because it reads in person as much more yellow than anticipated. We will be repainting it in the future. 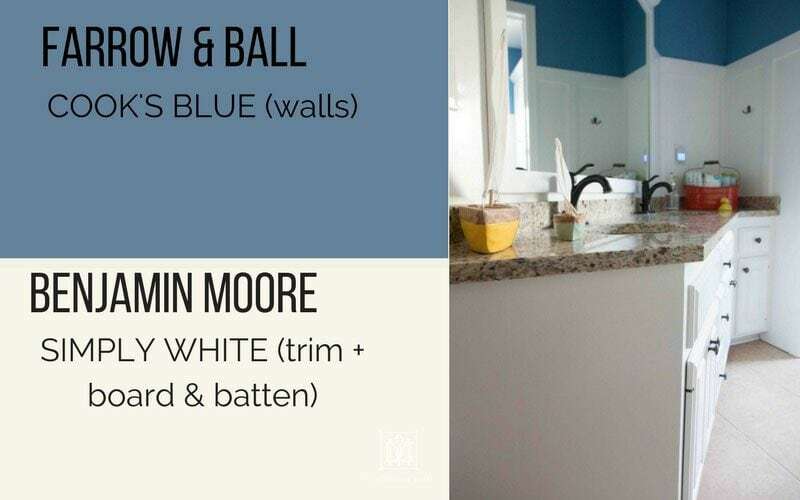 Farrow & Ball Cook’s Blue color matched by Benjamin Moore and cabinets, trim, and board and batten are BM Simply White. Look at the paint chips next to one another to see how they relate. Oftentimes, using different and varying paint colors in the same colorway will look cohesive but not boring. An easy way to do this is to take a paint chip and see the lightest paint on it, and the darkest paint chip on it. These interior paint colors will go together and only differ in saturation. Bring in your fabric and rug choices for the room. You want to get as big of a picture as you can before you choose the interior paint colors, and seeing everything in one place will help you visualize it! Look at lots and lots of pictures! 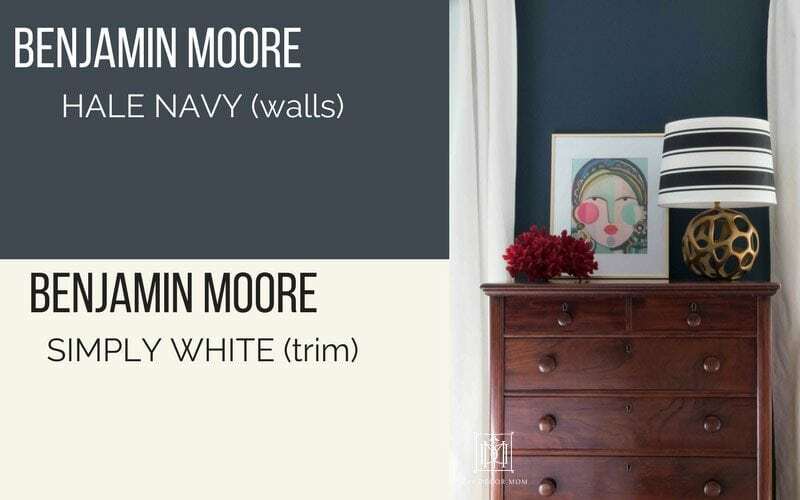 See the interior paint colors in actual rooms by searching for them online. Thank you for taking your time to post both paint swatch and actual painted area pictures. Article like this really helps us painters as well to picture paint colors in real life setting. Personally I love the Parma Grey (blueish grey) in the bathroom. Neutral but yet gives a bit of a blue-shade that makes the bathroom space look nice and clean.